Explanation: Each day can have a beautiful ending as the Sun sets below the western horizon. This week, the setting Sun added naked-eye sunspots to its finale, as enormous active regions rotated across the dimmed, reddened solar disc. Near the Sun's center in this closing telephoto view from November 7th are sunspots in Active Region 1339. Responsible for a powerful X-class flare on November 3rd, Active Region 1339 is larger than Jupiter. In the foreground, the ruined tower of a medieval castle stands in dramatic silhouette. 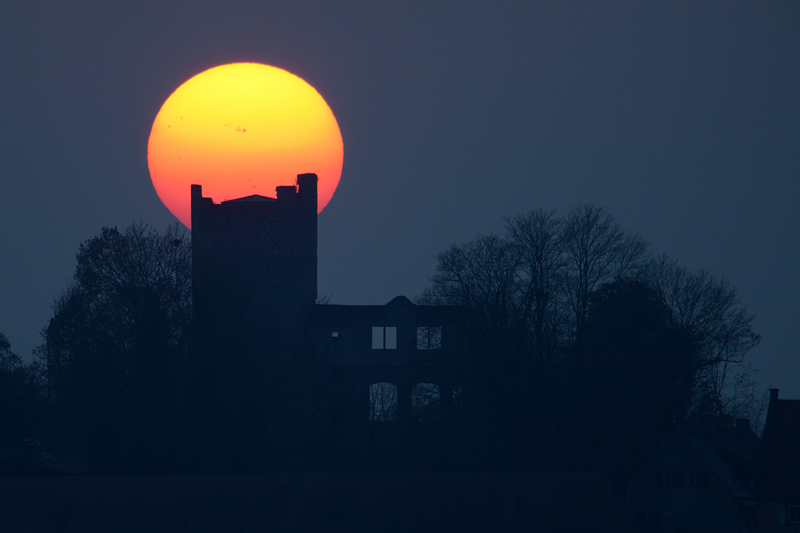 Located in Igersheim, Germany and traditionally known as castle Neuhaus, it might be named Sunspot Castle for this well-composed scene.